This has always been one of my favourite comic covers, and I loved Mike's redo as well (wasn't there a poster available at some point?)! Out of interest, how far along WERE the Utrom designs at that point? Thanks, Trist! I've always liked this cover a lot, too. And Mike Dooney's painted version of it was fantastic! (I think I may own that piece of art.) I believe there was a poster made with Mike's art at one time. Out of interest, how far along WERE the Utrom designs at that point?" I like this cover a lot too. Actually, I think my all time cover might be from the original printing of issue 2. I love the turtle reflections in the mouser. I was reminded by that with the issue of Tales that came out last month with the reflection of Raphael in Fugitoid's arm. Classic! This particular drawing is my favorite piece of TMNT art. I'm sure you're aware that it was used as the cover for the NES game as well. I currently have that Game Case sitting on my desk, along with my NECA Turtle figures, each posed just as they appear in the picture. -->> Zach read my mind..
.. DIGITIZED and Pixelated versions of the classic work.. This particular drawing is my favorite piece of TMNT art. I'm sure you're aware that it was used as the cover for the NES game as well. I currently have that Game Case sitting on my desk, along with my NECA Turtle figures, each posed just as they appear in the picture." I'm glad you like it so much. I remember having a blast going crazy with the machinery for the Utroms' transmat -- that was one of my favorite things to do when drawing the comics. Yeah! I used to have the poster with this art hanging on my wall as a kid. There was so much to look at and examine in the background. 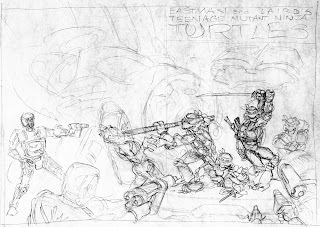 Theres another I had (that I still have) that you (Peter) and Kevin did of the turtles inside (I guess) the Technodrome fighting the Shredder. That's another that has a lot of tiny little things in the background. I always loved that about that artwork, so lively and intriguing.